The current building of fort Delaware was built in 1859 to replace the wooden fort there which was burnt to the ground. 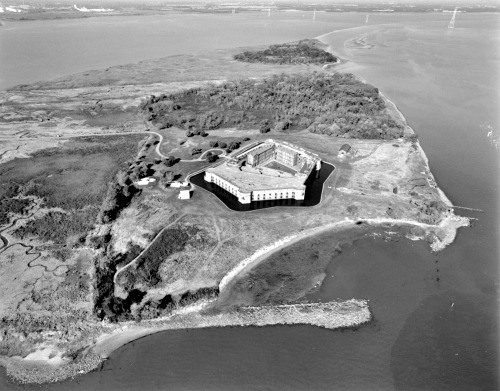 Located on pea patch island, the land has always been recognized as having important strategic value to the military and a defensive structure was first built here in 1812, being constantly upgraded and modified until it burnt down and was replaced by the current brick and mortar structure which stands today. The current fort building was used during the American civil war as a prison for confederate soldiers, in particular those captured in 1863 at the battle of Gettysburg. Alot of the prisoners who died at the fort are buried at Finns point cemetery nearby in New Jersey. There are thousands of stories of civil war ghosts and haunted buildings which were used in the war, and Fort Delaware is no exception. 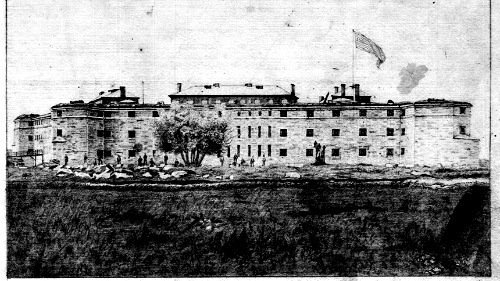 The fort was not designed to hold such large numbers of prisoners as it saw after the battle of Gettysburg when the fort was flooded with new inmates. The fort was expanded to accommodate the new prisoners by building wooden barracks around the lands to house them, but this had little effect to ease the over cramped, filthy conditions the fort had to offer its guests. Due to having a much higher population than it was built for, this led to very unpleasent conditions for the inmates and soon food was in very short supply. There were around 2,900 inmates that died while imprisoned at the fort, out of a total of around 40,000 that stayed there over the forts lifetime as a prison. Now i don't think i need to point out that almost 3000 lives being lost in a single building will lead to some very interesting tales of ghosts. There are various ghostly experiences to be found here at the fort, including the sounds of distant, muffled moans and cups being bashed against bars in empty areas of the building. There are a number of other claims from various visitors to the island, but three ghosts always seem to stand out. Firstly there is the ghost of an Italian immigrant who fought as a private in the union army, he is though to be called private Stefano and haunts the flight of stairs near the buildings main entrance. This ghosts is quite interesting since its claimed he can actually be provoked into making his presence known. The story of his demise is nothing more than a simple accident, as he just fell down the stairs one day and died straight away when he cracked his skull at the bottom. Saying his name or telling his story is said to trigger faint thudding noises coming from the stairs, as if he was falling down them all over again. People have also claimed to have seen his apparition standing at the bottom of the stairs, before silently fading away. The second ghosts identity is unknown but it seems they were a cleaner within the building since every time she has been seen she has been dressed as a cleaner and been stuck in the same repetitive pattern. Witnesses have seen her cleaning around were the fire mantle used to be before walking through a now bricked up door and disappearing. The third ghost is a female cook who haunts the officers kitchen and has only ever been seen appearing in the room itself and checking the cooking equipment, before disappearing on the spot or walking through a wall.